I think it is, and I liked season 1 too. Burning Hearts of Qo'nOs, Q2UnME, Turtletrekker and 1 other person like this. Absolutely. I have not felt this enthusiastic about seeing a new Trek episode since the 90s. With a change in tone and with a stronger emphasis on exploration, it's really giving me that certain classic Trek vibe that I don't think really felt fresh since possibly TNG. I'm looking forward to seeing how they keep it up for the rest of the season. JoeP, Turtletrekker, KennyB and 3 others like this. Season 2 is good, but I prefer Season 1. SpocksOddSocks and Ovation like this. Not a fan of season one, but have been pleasantly surprised by the uptick in quality of season two. Hopefully they can maintain their momentum. Jadeb, MoonlightSinatra and MakeshiftPython like this. Subject to adjustment by the end of the season, but thus far, I feel the same. Was this always a poll or did I just miss it the first time through? Absolutely. It has the positives of season 1 without (So far) its major problems. I like both seasons the the same. The second season simply has to be a bit different because there is no war in it any more. What does not change the fact that there is no return to the past and it is still a modern heavily serialized series. Supporters of series without a leading theme whose episodes can be watched in a random order will still be disappointed. JoeP, DaveyNY and Vger23 like this. They are both very different, which is why I appreciate them. Star Trek has always appealed to me because the same show can do "Doomsday Machine," "City on the Edge," and "Balance of Terror" right along side "Trouble with Tribbles, "I, Mudd" and "Piece of the Action"
I liked S1 a bit more, but S2 has way more potential. S1 was based on a premise that, in theory, I hated...but it rose above that in my eyes, and I ended up loving it in spite of that bias. On the other hand, S2 is like a dream premise (kind of like Indiana Jones in space...galloping across the galaxy getting in adventures while trying to solve a larger puzzle), but thus far has not quite lived up to it. JoeP, donners22, Alan Roi and 1 other person like this. Based on what little we've seen so far, the writers seem much more adept at the semi-episodic format than they were at sustaining season 1's more serialized approach. Last season we raced from shocking twist to shocking twist, intercut with absolute filler like the Pahvo episode and L'Rell standing around in her cell. The show made no time for Stamets to grieve Culber's death, but the writers found time for Tilly to get high with Clint Howard and for Eeevil Georgiou to have a completely inconsequential three way. That boggles me, though I'm willing to chalk some of the problems up to the troubled behind-the-scenes stuff. This year has been much more satisfying so far. lawman, Michael and MakeshiftPython like this. 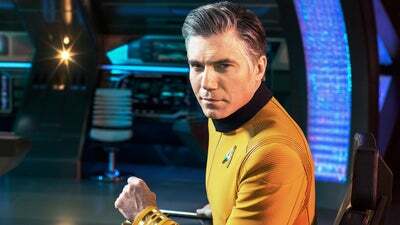 Yes, but Discovery will likely always be my least favourite Trek due to the fact it's all about Burnham, a character I can't stand played by a terrible actress. There are some parts of the show I enjoy but not enough to overlook Burnham/Sonequa. Supporters of series without a leading theme whose episodes can be watched in a random order will still be disappointed. Which simply isn't true. I enjoy episodic far more than serialized, but if it is entertaining, it is entertaining. Agree with you wholeheartedly. Bias and "tastes," combined with Real Star Trek(tm) expectations shape reactions, no matter what people believe about their purity and unbiased nature. It doesn't invalidate those felings, but it does lay waste to their rationalizing approach that something they don't like is objectively bad. JoeP, fireproof78 and PiotrB like this. For me it's like night and day. Some of the problems of season one are still present, but from what we've seen so far of season two the writer's seem to have a much better grasp of the tone, pacing and theme of the show. Which is a complicated way of saying: I'm enjoying it more. Hopefully there's still room for improvement, though. lawman, BillJ, Jadeb and 1 other person like this. Season One was utter trash. Show was elevated by Jason Issacs' compelling performance, but then they ruined his character anti-climatically. Season Two has 3 good episodes and 1 terrible one thus far. It's definitely off to a better start. The writing also seems to be taking more cues from classic Trek and Berman-era Trek. Speck will likely make or break this season, but I'm looking forward to the episodes beyond 2.05, when Harberts and Berg are fired. Those two are definitely responsible for some of the more divisive elements of STD S1, and deserved the axe. Same here. I enjoy both, and see no harm in preferring one over the other. JoeP and DaveyNY like this. JoeP, Campe98, Vger23 and 1 other person like this. The "Season 1 vs. Season 2" rhetoric has gotten almost as annoying as the "Orville vs. Discovery" debate. People love to draw battle lines. "You're either with us, or your with the terrorists!!!" JoeP, donners22, PiotrB and 2 others like this.